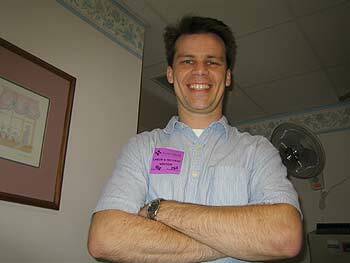 On April 6th, 2005, my wife Stacy went to visit her doctor. She was extremely pregnant, seven days past her due date. Her doctor let Stacy know that her cervix was dilated 4 cm, and that she should proceed directly to the hospital to have the baby that day. She called me, and I left work immediately. We rendezvoused at home and then drove together to Sutter Memorial hospital. We arrived at 11 am, very excited. This was the first baby for us. Stacy wasn't actually having the baby right then, but we were there to get the job done. She was going to be induced. 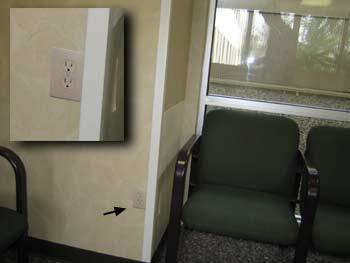 As she got undressed, there was time to stick an "instant outlet" onto the wall in the waiting room. 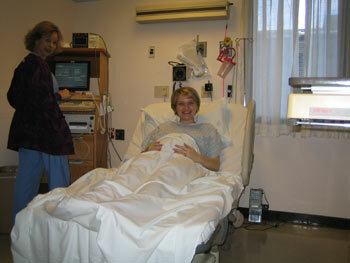 Soon, Stacy was changed and sat in a smallish hospital room, waiting for a real delivery room to open up. The nurse attached a blood pressure sleeve and hooked it to a monitor. 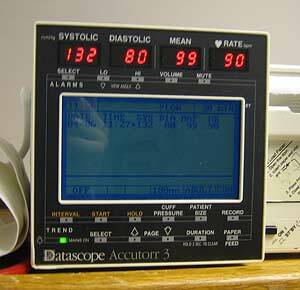 She also attached a sensor to report the baby's heartbeat and another sensor to detect the strength of Stacy's contractions. 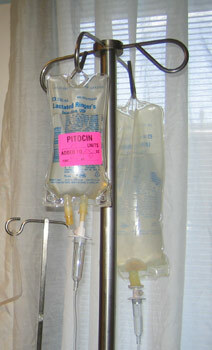 An intravenous drip was put into her arm, so that Pitocin could be introduced into her bloodstream. This would help artificially accelerate her uterine contractions. If I had known the bag-hanger thing was going to have so many hooks on it, I would have brought my own bag. I mentioned this to the nurse and she let me know that this was not a BYOB hospital. 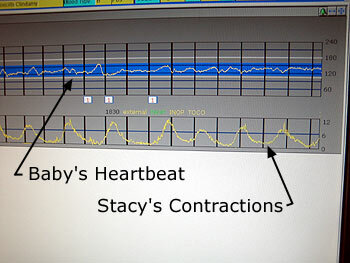 Stacy's new belt monitors were hooked to a computer with a nice graphic timeline illustrating the baby's heartbeat and the strength of Stacy's contractions. In this photo, the lower set of yellow humps show mild contractions about four minutes apart. Neither monitor was the most accurate device. 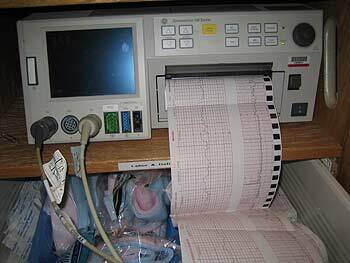 They were strapped to Stacy's belly, and their positions had a lot to do with how strong the heartbeat and contractions appeared to be. In addition to the computer screen, a printout was slowly crawling out. I reprogrammed the printer to also show the rise and fall of my Krispy Kreme Donuts stock. In retrospect, this was extremely selfish. We spent the early afternoon waiting for the pitocin to take effect. We both made phone calls and braced ourselves for the uncertainty ahead. Stacy was concerned that she hadn't had anything to eat. She was already hungry and knew she wouldn't be allowed to eat anything until the baby was out.